I have been a fan of WipeOut ever since it came out on the PlayStation console. The game is simple enough: ride in one of these hovercrafts and race against time over futuristic tracks. But there's more to it than racing; on the tracks are symbols which you can use to speed up, or arm your vehicle for defense or attack. The addition of this "battle" element and randomly getting these adds to the strategy of the game. And then you have to win the races in order to unlock additional tracks. It has a nice line of background Techno music as well. I played the PlayStation version plugged into my 5-channel surround sound system and it was a thrill ride! I played by my lonesome, as it was essentially a single-player game. 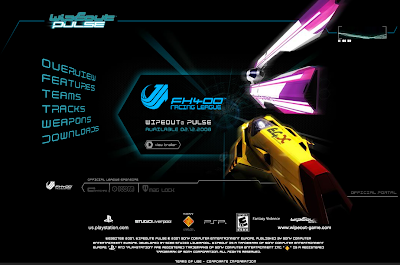 The inclusion of the WipeOut series to the PSP games arsenal is a welcome addition. Indeed, the animation is fluid, the music is cool, and the weapons are just as deadly. And, it's multiplayer! I have been coaxing my friends to install WipeOut so we can try the multiplayer mode but we have yet to test it out. If you are a fan of racing games, WipeOut will surely be a nice title to add to your list. Heck, I am not a racing game fan at all but I enjoy playing WipeOut. It's like Podracing in Tatooine!